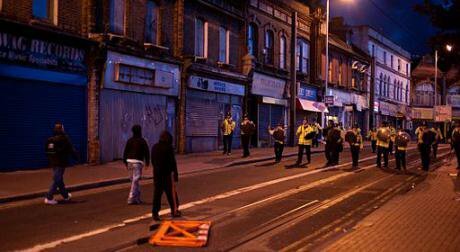 Standoff between police and rioters, Croydon, London, 2011. Wikicommons/ Raymond Yau. Some rights reserved.As the soul searching sets in after the Paris attacks, pundits will zoom in on France’s policies towards immigrants and minorities. But a look into history cautions against hasty blame games. As more details are emerging about the perpetrators of the Paris attacks, much of the discussion in the coming weeks will unavoidably focus on the alleged shortcomings of integrating immigrants and minorities into European societies. Similarly to the attacks on Charlie Hebdo earlier this year, it turns out that some, or even most, of the terrorists were born and raised in Europe. This realization should forbid simplistic confounding of Syrian refugees and terrorism; of the kind found in Niall Ferguson’s demagogic analogy between contemporary Europe and the fall of the Roman Empire allegedly overrun by “barbarians.” Yet the perpetrators’ European upbringing does urge a closer look at the social situation in France’s infamous banlieues once more. Public debate in France, but especially outside of France, is prone to searching for national particularities that can help explain why the grande nation appears more vulnerable to Islamist terrorism than its neighbors. A first obvious answer, which perhaps goes without saying and is hence discussed only rarely, is France’s greater military engagement in Syria—rendering the danger a little less acute in, say, Germany, Belgium, and the Netherlands. But since this says nothing about the origin of the terrorists, questions persist as to the role and treatment of ethnic or religious minorities in European societies. The blood had barely dried on the Paris’s streets before German journalists began to ask whoever appeared near a microphone why France had ‘failed’ in its policies towards ‘integrating immigrants’, implying that this failure was the chief culprit for radicalizing young French Muslims. The British media’s variant of the same reflex typically points to France’s long-cherished ‘republican model’. According to this reading, the unwillingness of the French to admit the importance of ethnicity and race, alongside their secularism and their assimilationist desires, has exacerbated tensions in the suburbs, effectively by brushing under them under the carpet. Prohibiting the collection of ethnic statistics, this argument holds, covers up real problems and, by disallowing ethnic identity politics, hinders the emergence of moderate community leaders, whose absence then leaves the field open for radicals. The implicit contrast here is with Britain’s ‘model’ of multiculturalism, which assorts people into boxes that allegedly channel minority politics in a more benign fashion. This British-French dichotomy already informed the British reading of Paris’s suburban unrest in 2005 and will now doubtless reappear. Although intelligent observers do not fail to note that London had its own riots in 2011 and that the perpetrators of the attacks on the London Underground in 2005 were also born and raised in Britain, for some reason this insight does not lead them to reformulate their stance. Instead they persist in seeing a direct link between these alleged ‘models’ and countries’ vulnerability to homegrown terrorism. Yet a look across boundaries and into the past, reveals the tenuous nature of this causal relationship. If one looks at the numbers of jihadist fighters that each European country had sent to Syria and Iraq by December 2014, then the per-capita list was led by Belgium, Denmark, and Sweden. The Belgian connection in particular is emerging clearly in the recent Paris attacks. Yet, no one would point to the extraordinary ‘failure’ of a supposedly typical Belgian, Danish, or Swedish ‘model’ of immigrant integration. It seems strange to single out France as having a specifically ‘French problem’—apart from its more assertive military role abroad. It is also worth noting that, until not so long ago, much of the European left cheered French republicanism for being less exclusionary towards minorities than other ‘models’. In the early twentieth century, African Americans celebrated an alleged absence of racism in France. As late as the 1990s, French citizenship conferred on the basis of place of birth was contrasted favorably with Germany’s exclusionary practices, which still treated third-generation immigrants as eternal ‘foreigners’. So, if anything, the explanatory burden must account for when, how, and why a ‘model’ once hailed for being conducive to swift ‘integration’ supposedly turned into a vehicle for exclusion and marginalization.